Greenville quarterback Tyler Beyke (18) avoids a sack late in the first quarter then picks up some blockers and rumbles 20 yards for a touchdown to put the Green Wave ahead 21-0 against Stebbins in the home-opener Friday night at Harmon Field. Greenville went on to win the game 49-19 to improve to 2-0 on the season. 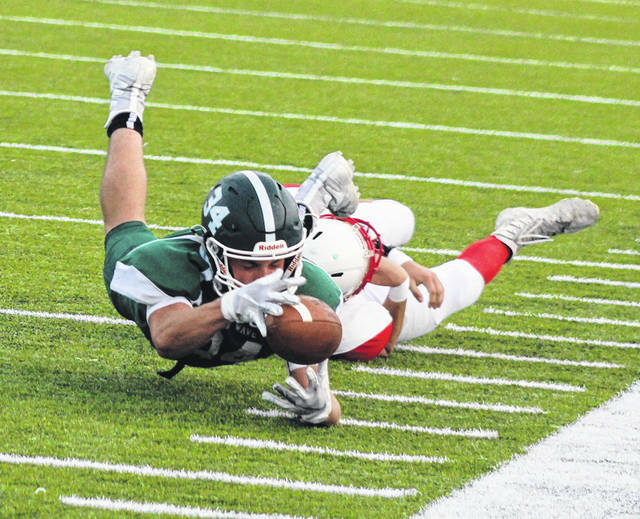 Greenville running back Landon Eldridge lunges forward to get every yard he can before going out of bounds during the first half of the Green Wave’s home opener against Stebbins on Friday night at Harmon Field. Eldridge had a big night for the second straight week as he rushed for 181 yards and four touchdowns in a 49-19 victory. Stebbins quarterback Austin Womack (8) just gets rid of the ball to avoid the sack as Greenville’s Nathan Fry brings him down in the backfield. 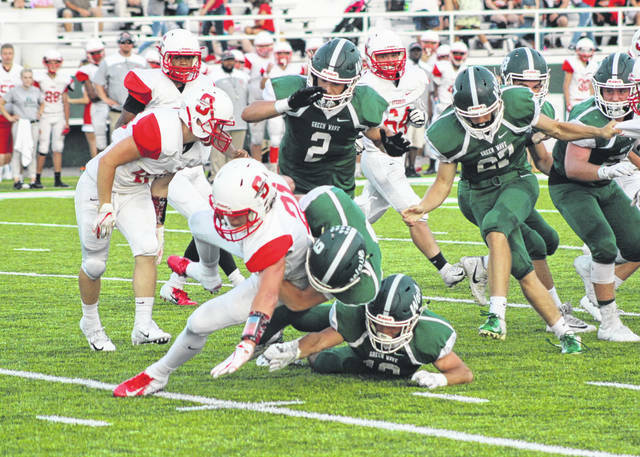 Greenville’s Alec Fletcher (9) and Evan Saylor (10) gang tackle Stebbins running back Dan Johnson (21) during first half action of the Green Wave’s home opener Friday night at Harmon Field. Greenville improved to 2-0 on the season with a 49-19 victory. GREENVILLE – Dating back to 2010 when Greenville rejoined the Greater Western Ohio Conference, the Green Wave has not started a single season 2-0. 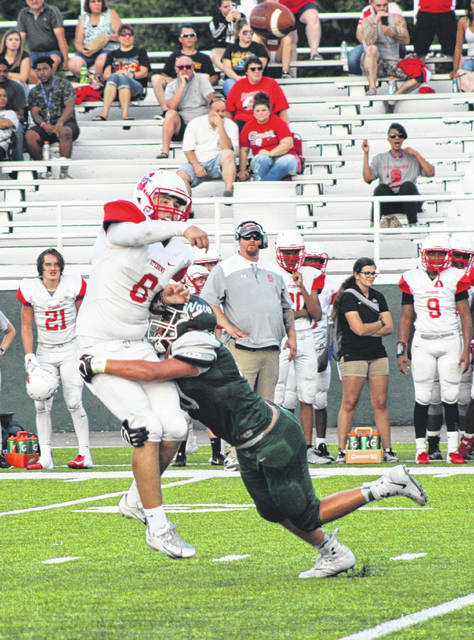 Harmon Field was rocking as Greenville held its home opener against Stebbins Friday night and the Wave wasted no time whatsoever in showing the Indians just how this game was going to go. GHS piled up 21 points in the first quarter alone en route to a 49-19 victory. Landon Eldridge, last week’s workhorse in a 40-7 win at Eaton, handled the bulk of the workload again. He ran for 181 yards and four touchdowns including his first one on Greenville’s first offensive play of the game. It was a 51-yard scoring jaunt with 9:50 left to play in the opening frame. On Greenville’s next possession, which came following a punt block by Nathan Fry giving GHS the ball on the Stebbins 30-yard line, Eldridge capped the short drive with a 2-yard plunge and a 14-0 lead. But Eldridge wasn’t the only one making plays out of the backfield. Junior quarterback Tyler Beyke used his arm and his legs to the tune of three touchdowns on the night. He connected with Marcus Wood twice on touchdowns while throwing for 102 yards total and he also ran the ball well when he needed to for 38 yards and a rushing touchdown. Beyke was happy with his effort too, but heaped plenty of praise on his teammates for their contributions. “It feels great as a player running for a touchdown and throwing for two more, but it’s not about individual players,” Beyke said. “We play as a team and I couldn’t have made any of those long runs or passes without the line and the receivers doing a great job. We did a great job as a team. Speaking of the defense, the Green Wave forced five Stebbins turnovers in the game, four of them on interceptions one each by Wood, Eldridge, John Butsch and Colton Zumbrun. The other turnover was a fumble recovered by Dru Quinn. “That’s huge for the defense,” Shaffer said. “If you can shorten their drives and put yourself in good field position with a turnover or two that’s always good. I thought we played hard and tackled well. We knew Stebbins had some skill kids out on the edge and a quarterback who could sling it, but he never really got off on us the way he potentially could have so all in all I’m pretty pleased with the way the defense played tonight. In the second quarter, Greenville continued its offensive explosiveness with first of two Beyke-to-Wood touchdown connections. The first one went for 14 yards to give GHS a 28-7 lead. Eldridge scored the next two Greenville touchdowns on runs of 1 and 5 yards respectively which built a 42-7 lead. The final Greenville points came on the second Beyke-to-Wood touchdown pass that went for 5 yards. Wood and Butsch each caught three passes from Beyke. Wood covered 37 yards total with a pair of touchdowns and Butsch was the top pass catcher with 52 yards receiving. 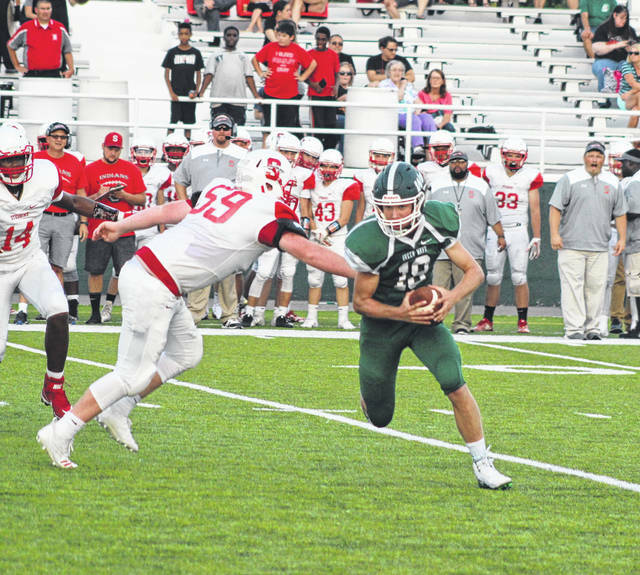 Evan Saylor also had a sack for the Green Wave defense and Tony Sells was the leading tackler with six tackles. Butsch and Hayden Sharp had five tackles each. This week will be a short week for Greenville as they prepare to play under the lights at Chaminade Julienne on Thursday night. It is part of the Fox 45 and ABC 22 Thursday Night Lights event, which is in its third year. “We’re going to enjoy this win right now,” Shaffer said. “Our kids deserve some time to enjoy the spoils of victory I guess you could say, but they basically don’t get a day off this week. Normally our off day falls on Sunday, but we’ll be doing some film review and some scout work and things like that with playing on Thursday night. The Greenville-Chaminade Julienne game will kick off at 7 p.m. Thursday and can be seen on channel 45.2, channel 995 on Spectrum, channel 44 on DISH and streamed live online at mytvdayton.com as well as on Facebook. This entry was tagged Aaron Shaffer, Green Wave, Greenville, GWOC, Harmon Field, Landon Eldridge, Stebbins, Tyler Beyke. Bookmark the permalink.